A classroom full of 6th grade students in Chicago play the opening chords to Joan Jett's "I Love Rock and Roll" and 800 miles away in lower Manhattan, another group of kids joins them for a jam session via video-conference. Both classes were just outfitted with brand new Epiphone Les Paul electric guitars, compliments of the Les Paul Foundation. "This is the best class of the day," says Alejandro, a student at Lower Manhattan Community Middle School. 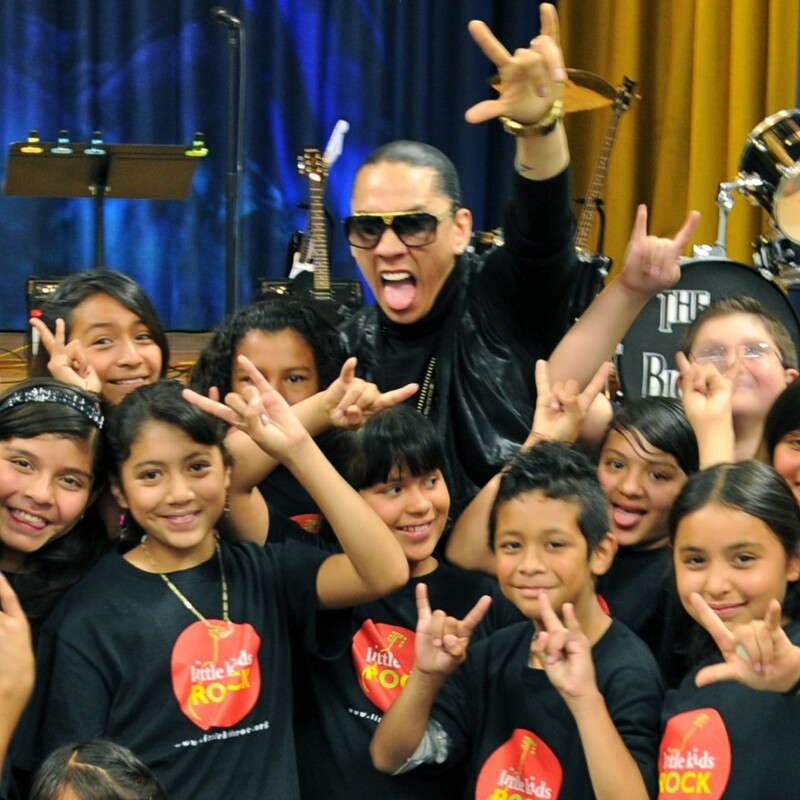 The Black Eyed Peas’ Taboo Raps and Little Kids Rock! When third grade teacher, Jose Vergara, received free training and instruments from Little Kids Rock, his students thought their dreams had come true. They never dreamed that they could be learning to play Black Eyed Peas songs on the guitar in school! 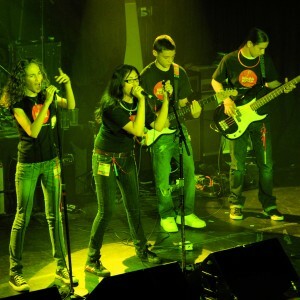 Dreams they never thought they had were realized when The Black Eyed Peas' Taboo surprised them by delivering 10 Fender® electric guitars to their school and joined them onstage to perform "I Gotta Feeling." A hush fell over the eager crowd of students, teachers and parents gathered in the darkened auditorium of I.S. 162 in the Bronx. When the lights came up, the room shook with thunderous cheers, as nearly 50 elementary school students from neighboring P.S. 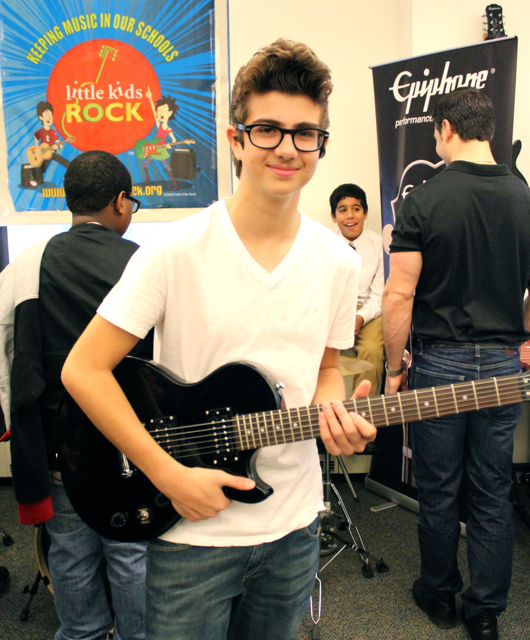 11 burst into Taylor Swift’s hit song, “Love Story.” The synchronous strumming of dozens of guitars kicked off the second annual Little Kids Rock New York City Jam Summit, which featured more than 100 students, ages 8 to 18, from eight New York City Public Schools. Bootsy Brings ‘da Funk to Jersey City! On Fridays, kids often watch the clock in eager anticipation of the end of the school week. This was not the case at Franklin L. Williams Middle School in Jersey City last Friday. John Flora's Little Kids Rock students instead waited eagerly for two famous bassists to arrive and rock their worlds. 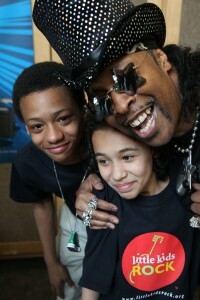 Rock and Roll Hall of Fame funk superstar, Bootsy Collins (Parliament-Funkadelic and James Brown) and hip hop legend, Brian Hardgroove (Public Enemy), walked into a classroom full of smiling faces, tuned-up instruments, and the future rockstars who play them! Accomplished bassist Jon E. Gee had a day off before his concert with John Mellencamp at Radio City Music Hall in NYC and wanted to find something to do to fill the vacancy in his schedule. 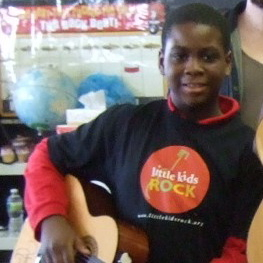 He decided to team up with Little Kids Rock to help fill a vacancy at PS 98 Shorac Kappock in Manhattan, where children have been learning to play guitar and write their own songs... with no bass guitar! 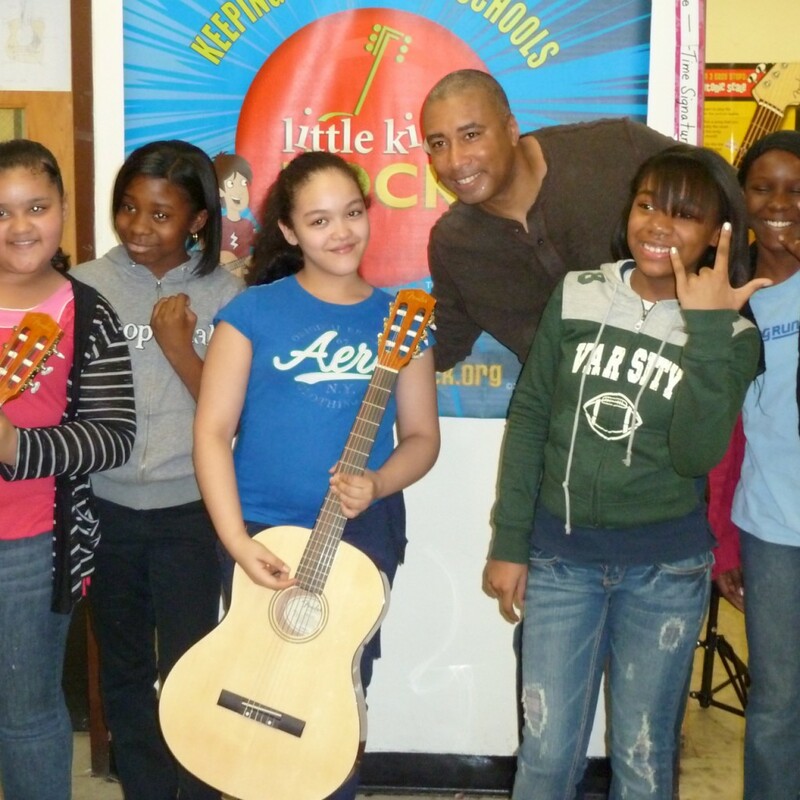 Though Bernie Williams left baseball to pursue a music career, he is still a fan favorite. 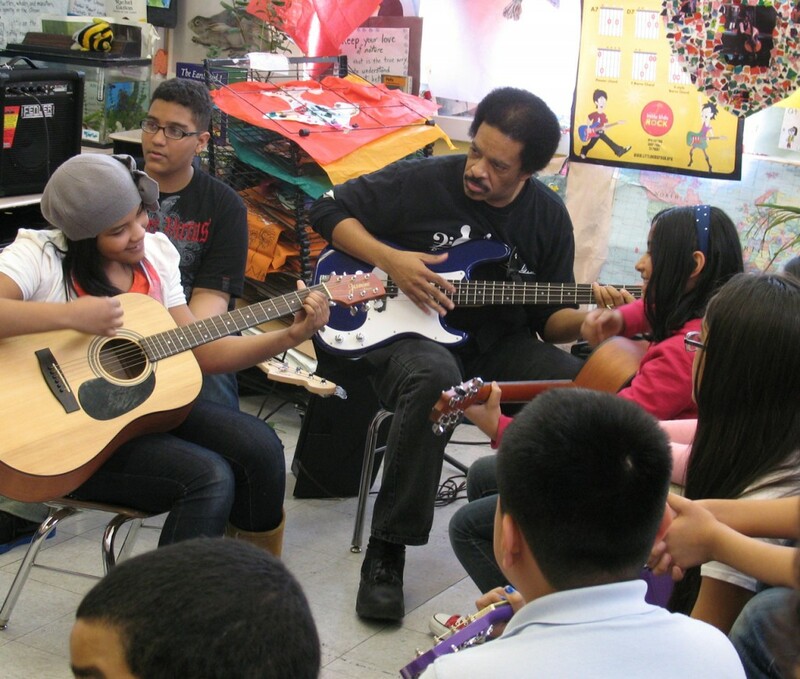 He recently visited IS 162 - Lola Rodriguez De Tio Academy of Future Technologies, a Little Kids Rock school in the Bronx, to deliver ten acoustic guitars and two electrics guitars to Allan Adkison's music class. He jammed with the kids on "We Will Rock You" and "Stir It Up," answered lots of questions about music and even a few about baseball, stating that music was actually his first love! One year ago, other children described Akil as the kid who didn’t speak. Now, they describe him as the kid who speaks with his guitar! Akil is a 10-year-old Philadelphia student who suffers from Selective Mutism Disorder. He has not uttered a word in school since he began attending. Aside from making his academic life difficult, Akil’s disorder makes social interaction nearly impossible.